The untold story of a quirky and important subculture: The world of 78rpm records and the insular community that celebrates them—by acclaimed music critic and author Amanda Petrusich, who contributes regularly to Pitchfork, The Oxford American, and The New York Times. — John Jeremiah Sullivan, author of "Pulphead"
— Ann Powers, author of "Weird Like Us: My Bohemian America"
"I don't know hillbilly from Blind Willie, but I loved Amanda Petrusich's archaeology of an almost-lost world of American music. Do Not Sell at Any Price is like a well-loved 78: it pops, it crackles, it seduces utterly." — Ken Jennings, author of "Maphead"
— Rob Sheffield, author of "Love Is a Mix Tape" and "Turn Around Bright Eyes"
"Amanda Petrusich’s fascinating and insightful journey into the arcane netherworld of 78 records and its bring-‘em-back-alive collectors brims with the joy and passion of discovery, along with a heartfelt affection for those who keep alight the flame of our musical heritage." — Lenny Kaye, guitarist, "Nuggets" anthologist, author "You Call It Madness"
— Will Hermes, author of "Love Goes to Buildings on Fire"
— William Ferris, author of "Blues from the Delta" and "The Storied South"
"An engaging and deeply personal journey, for both the writer and her subjects, and an adroit disquisition on the nature of this distinctly American form of insatiable lust." “[Petrusich] weaves her interviews with personalobservations and just the right amount of dry humor to make us feel as if we’relooking (and listening) over her shoulder as she travels up and down the EastCoast…a propulsive read." 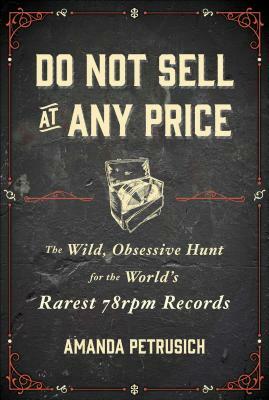 "Do Not Sell at Any Price is full of little epiphanies ... [Petrusich's] persistence pays off in the form of stories and observations that humanize the collectors and their pursuit ... [Petrusich] effectively uses the prism of her personal experience to analyze the aesthetics of collecting, consuming and enjoying music." "A profound rumination on the idea of recording, asking what it means to capture sound, to be moved by it, and ultimately, to obsess over it. With “Do Not Sell at Any Price,” we have an astounding new writer not of musical criticism but of longform narrative prose. When Petrusich writes about music, she is akin Keats writing about a Greek vase: She is telling us what it means to be human beings adrift in time." "In this entertaining book about the finite universe of oddballs who scrounge frantically to collect the shellac fossils the rest of us consider worthless, you get all the joy of discovery without having to grub through boxes at garage sales.... Petrusich proves an engaging, frequently funny tour guide." "Full of strange, even beautiful, tales of obsession....Even someone who knows little or nothing about 78s will find Petrusich's book an incredibly enjoyable read." "A wise, entertaining study of 78 rpm collectors.... Petrusich writes beautifully." "Exquisitely crafted...an offbeat experiment in embedded journalism." "This book is so alive to its subject, to the grail of the music.... Petrusich will make you desperate not only to hear the records she’s writing about...but to feel the way they make her feel, to feel the mask dissolve on your own face. "A travelogue into the most beautiful corners of obsession. Petrusich is a top-flight music writer—meticulous, generous, and deeply informed. But she’s also a terrific curator of human subjects, from the lovesick collectors who make up the bulk of her narrative to the towering, still-shadowy names that grace these circular hunks of shellac... Do Not Sell At Any Price is as idiosyncratic, alluring and totally alive as the scratchy sides that consume it."